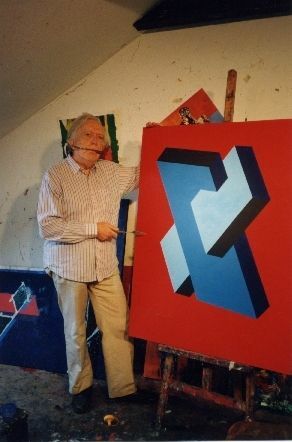 Oscar Reutersvärd was born in 1915 in Stockholm. He was trained in arts by russian immigrant professor of Academy of Arts in St.Petersburg Michael Katz. He created the first impossible triangle out of a series of cubes in 1934. For years of painting artist had created more than 2500 impossible figures. All of his figures are represented in parallel (japanese) perspective in it's puriest form only with blocks. Oscar Reutersvärd is a professor of Art History and Theory at Lund University (Sweden), founder in 1950 and fellow of the International Association of Art Critics IAAC, fellow of the American Association for Aesthetics and of the Societé de l'Art Francais. Professor Reutersvärd is a regular contributor to the American Journal of Aesthetics and Art Criticism, Gazettes des Beaux-Arts and D'ars and has published numerous papers and articles on the utopists of architecture and paintings from the time of the French Revolution and on the abstract sculpture and painting movements of the twentieth century. In 1980 a series of postage stamps with three figures of Oscar Reutersvärd was printed in Sweden. In this section you can see images from "Window in the floor" series, where the most complex impossibilities were used, and artworks from "European Flags" series. Also, You can find many copies of Reutersvärd's artworks in Figure Library.